This chapter views the trend and cyclic components of the major absolute and relative indicators of world dynamics. We show that the second millennium ce saw a rather remarkable change in the trends of technological development, population and GDP dynamics as compared to the first millennium ce. While the growth of relative indicators (first of all, GDP per capita) was still quite weak in 1000–1800 ce, many absolute indicators (population, GDP, cumulative number of inventions, and so on) followed pronounced hyperbolic upward trends, which we will try to explain in this chapter. Starting from the Neolithic Revolution, the world population became 100 times larger by 1800. Although the wellbeing of the population did not change much in terms of relative food consumption, technological progress was remarkable and made it possible for a much greater number of people to live on the planet. As for the cyclic dynamics, we will briefly describe the nature and impact of sociodemographic cycles (basically inherent to all complex agrarian systems). 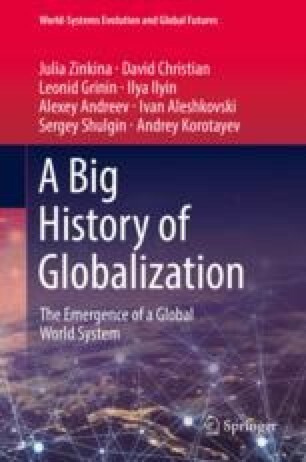 The early stages of globalization (along with climatic changes) were directly related to the gradual synchronization of sociodemographic cycles throughout many parts of the Afro-Eurasian world-system. Nefedov, S. A. (1999a). On the demographic cycles in the history of Babylonia. Manuscript (#54930) deposited in the Institute of Scientific Information on Social Sciences of the Russian Academy of Sciences, Moscow. Accessed March 18, 2017, from http://www.hist1.narod.ru/Science/Babilon/Vavilon.html (in Russian). Nefedov, S. A. (1999b). On the demographic cycles in the history of ancient Egypt. Manuscript (#54931) deposited in the Institute of Scientific Information on Social Sciences of the Russian Academy of Sciences, Moscow. Accessed April 2, 2017, from http://www.hist1.narod.ru/Science/Egipt/Egipt.html (in Russian). Nefedov, S. A. (2000). On the demographic cycles in the history of China (14th–19th centuries). Manuscript (#128367) deposited in the Institute of Scientific Information on Social Sciences of the Russian Academy of Sciences, Moscow. Accessed April 6, 2017, from http://www.hist1.narod.ru/Science/China/China1.html (in Russian). Nefedov, S. A. (2001). On the demographic cycles in the history of India. Manuscript (#556324) deposited in the Institute of Scientific Information on Social Sciences of the Russian Academy of Sciences, Moscow. Accessed March 14, 2017, from http://www.hist1.narod.ru/Science/India/india.html (in Russian).